While there had been a few half-hearted attempts before, the U.S. entry into the world's fair sweepstakes came on the 100th anniversary of the birth of the republic. 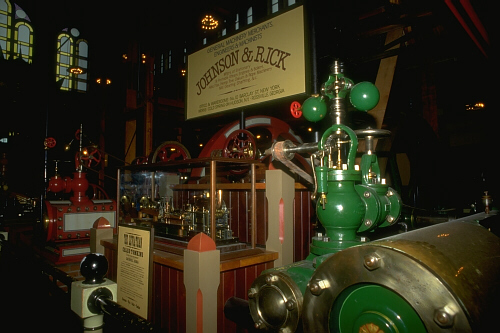 Philadelphia was the natural site for this Centennial Exhibition, which centered on a vast machinery hall, holding 13 acres of new devices, widgets, and gadgets. 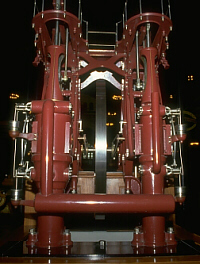 One of the most popular exhibits in the Machinery Hall was a prototype slice of the cable that Roebling Brothers would use for the Brooklyn Bridge. They would end up using 6.8 million pounds of these first galvanized cables, covered with Zinc and with a strength of 160,000 pounds per square inch (double that of the iron wire used at Niagara). On opening day, the hall was full of people, but dead silent as President Ulysses S. Grant and the Emperor Dom Pedro of Brazil climbed up on the engine platform and hit the levers that allowed steam into the cylinders. The engine hissed and the floor trembled. Then, the huge walking beams slowly started moving up and down, feeding the giant flywheel which spun around, gaining momentum and storing energy. 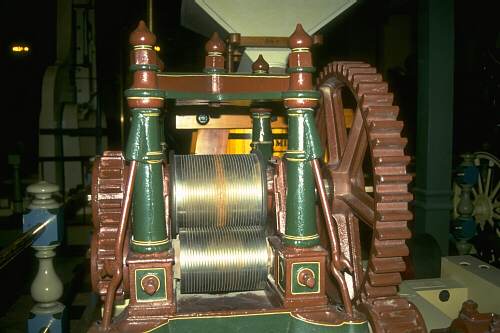 Then, belts started moving, and shafts and pulleys started turning as power went out into the hall. 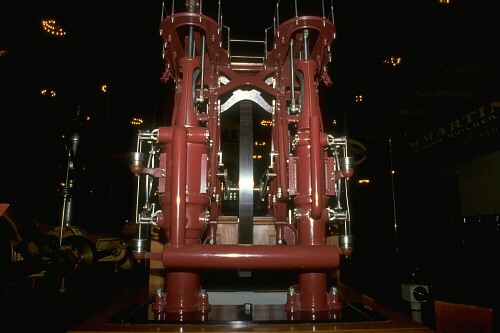 To preserve the results of the Centennial Exhibition, the Smithsonian Institute built it's second building on the Washington, Mall, The Arts and Industries Building still contains many replicas of the devices in the Machinery Hall, including a model of the great Corliss Engine. Louis C. Hunter and Lynwood Bryant, A History of Industrial Power in the United States, 1780-1930. Vol 3: The Transmission of Power MIT Press (Cambridge, MA, 1991), p. 207-208. Henry Petroski, The Evolution of Useful Things, Knopf (New York, 1992), pp. 100-101.